El Pres tries to blend into the background in his nicely understated shirt. Neil - In short, an average curry house next door to a great pub (The Blue Lion). On the plus side, the curry for the veggie biryani was nice and spicy but the stuffed paratha was undercooked and pretty pointless. Not much to say otherwise apart from noting that the super small samosa starter won't ruin your appetite. 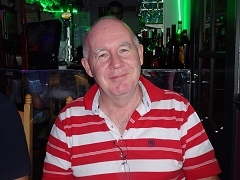 Graeme - Another enjoyable visit to the Blue Lion which was surprisingly empty for a Thursday evening. El Pres confused us by saying "meet you in the courtyard at the back" when, in fact, he was sat by the window at the front! 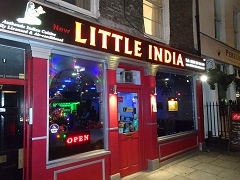 The Little India is an average restaurant - there's nothing serious to fault but nothing stands out either. My Fish Tikka starter was nice but quite small. For main, I had (for possibly the first time in my curry-eating lifetime) a Chicken Dansak. It was very pleasant and I wouldn't be averse to having one again but I probably won't choose one for a while. I thought the cost was too high, especially as I only had one beer (I don't know about other people). Lots of talk about the World Cup with largely positive views about how England conducted themselves both on and off the pitch. I'm still not sure that we over-achieved, I described it more that we didn't under-achieve. Jon - After a pleasant walk in the sunshine and a few refreshing pints at the Blue Lion, the main event at the Little India did not disappoint. The starter menu is perhaps a little disappointing, and I went off-menu for a decent reshmi kebab, but there was plenty to choose from for the main course and I went for something other than my usual, this time a lamb sagwalah, and it was very good. Plenty of tender lamb and good spicy sauce, accompanied with a good special rice. A few of us continued for another swift beverage at the Blue Lion to round off another good evening. Dave - Not a bad performance from Little India. Having just started on a diet (again), I ventured off piste from the Griff set menu for the 2nd month running and ordered lamb chop starter followed by chicken shaslik - both of which were good. Can't comment on bread as none had. Also had no booze which made me notice just how loud we are as a group - I'm sure I'm not that loud when I have had a drink. Dominic - Considering our December visit here was when my taste buds had packed it in due to flu, I was looking forward to this visit to finally sample the cuisine as part of the club. The layout is modern and comfortable and the service very good all night. I took a cue from Jon and also had an off-piste Reshmi Kebab which was quite tasty especially given the poppadom condiments were made available. For main, I chose a Lamb Tikka Phall from the "Dishes since 1958" part of the menu which was quite good although the sauce was a little runny. Of the rest, the Brinjal Bhaji was excellent and the wine very well priced. A free round of liqueurs was also a nice touch. Another enjoyable evening which was highlighted by a certain member's enigmatic comment of "I can't believe I didn't make the moneyshot" - I really think someone should explain to him what that actually means!!! Tim - The Little India was surprisingly quiet, I think there was only one other table in use. The place is smart, and has some interesting lighting, though the lights seem a bit random. It was nice to see both bottled Cobra and Kingfisher, as well as draft Cobra. The wine, courtesy of Dom, was good too. The spicy poppadoms were a bit undercooked and hard. For the starter, I had fish tikka. The unidentified white fish was very bland and had no texture; next time I'd go for the chicken or lamb, but the overall flavour was ok. For the main, I had the Little India special, which featured lamb and chicken ... and a lot of onion - it looked a bit like a whole onion had been quartered and then softened and stirred in. As I don't particularly like large pieces of onion, this was unfortunate, but the flavour of the sauce was good and the meat tender. The service was good, though considering the place was quite quiet, they didn't have a lot else to do. A free round of liqueurs at the end was most welcome. Mark - Same old, same old for me as Little India delivered what you might expect from a more traditional curry house than some of the upmarket (up their own a$$es?) places and, with a good pub next door, almost like turning back the years to a local high street ruby. Lamb Tikka starter fine while the Chicken Biryani main was hotter than usual. Overall it was a good evening in the heat of this summer but no stand out. Glad to see Jon back from behind the Iron Curtain but a small turnout due to school hol's - perhaps we need a Diggers rule 2? No singing this month due to a sober Griff I suspect - if only he could work out email. Trains were OK today.